I was already blown away from the first moments of Chained, which posits that although we tend to like actors because they are beautiful, exceptional beauty is as much an aberration as grotesque physical deformity. The rest of the film expands on this destabilizing observation, portraying the connection between a beautiful actress shooting a film and her co-star, a disfigured man. What if the “freaks” had made Tod Browning’s “Freaks”? 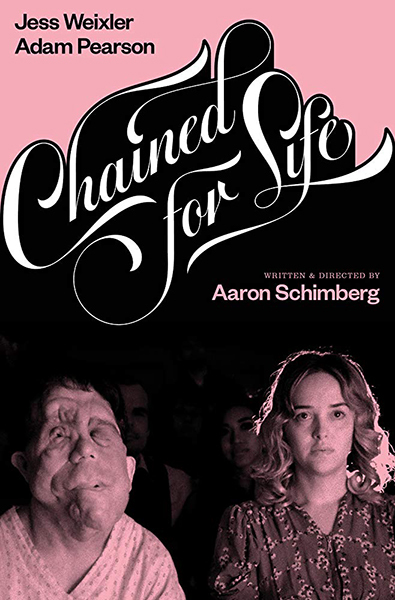 That seems to be the guiding impulse behind Aaron Schimberg’s second feature “Chained for Life” as he follows his intriguing 2013 black-and-white dreamscape “Go Down Death” with an even more challenging mix of outre form and content. Easier to admire than to love, this fascinating meta-narrative involving a film crew making a quasi-horror movie about physical disabilities keeps viewers at a deliberate distance — the better to make us question the nature of what we’re seeing (and thinking). She’s more interested in getting close to her other co-star, Rosenthal, a man who like the actor playing him (Adam Pearson) has neurofibromatosis, a condition that results in non-cancerous but disfiguring nervous-system tumors. The “Elephant Man” appearance it lends gives him a monstrous pathos in the film-within-the-film. But on-set, Rosenthal is simply a friendly, self-deprecating, rather ordinary bloke in every way save appearance. In any event, Mabel/Freda is attracted to him — though it’s difficult to tell whether her interest is sincere, based professionally on Method, or just politically correct. A traditional beauty among the oddballs (Herr Director has cast other “freaks” beyond Rosenthal, including such carny favorites as a Bearded Lady), she professes not to care about image even as she spreads her own actorly neuroses on the proceedings.